Without a single action from Congress, the ATF just moved to ban bump stocks nationwide. To make this happen the agency has made some legally questionable moves. Now, a grassroots pro-gun group in Virginia is starting to fight back. The Virginia Citizens’ Defense League (VCDL) announced they are joining the case to fight the ATF’s bump stock ban. The lawsuit was originally filed by the Gun Owners of America (GOA). Now, both pro-gun groups are together seeking an injunction to protect gun owners from the sudden bump stock prohibition and to prevent hundreds of thousands of Americans from facing criminal charges. “They’re trying to make a new law, and they can’t do that; that’s for Congress” VCDL President Philip Van Cleave told New Virginia Press. Beyond the action itself, Van Cleave was appalled at the retroactive nature of the policy. “Too bad you bought a product when it was legal. Now [the ATF is] going to take that away without giving you a penny in return”. Van Cleave explained. “We can’t let them get away with that”. Earlier this week, the Bureau of Alcohol Tobacco Firearms and Explosives (ATF) took a legally dubious step towards banning bump stocks. Without the authority to create law, the ATF had to develop an opinion to maintain legal credibility for its actions. To do so, the ATF announced they will classify bump stocks as machineguns, which are already prohibited in many cases. This effectively bans bump stocks with the threat of criminal penalties if Americans don’t comply. That leaves hundreds of thousands of Americans at risk of criminal charges for possessing what was a legal accessory at the time. 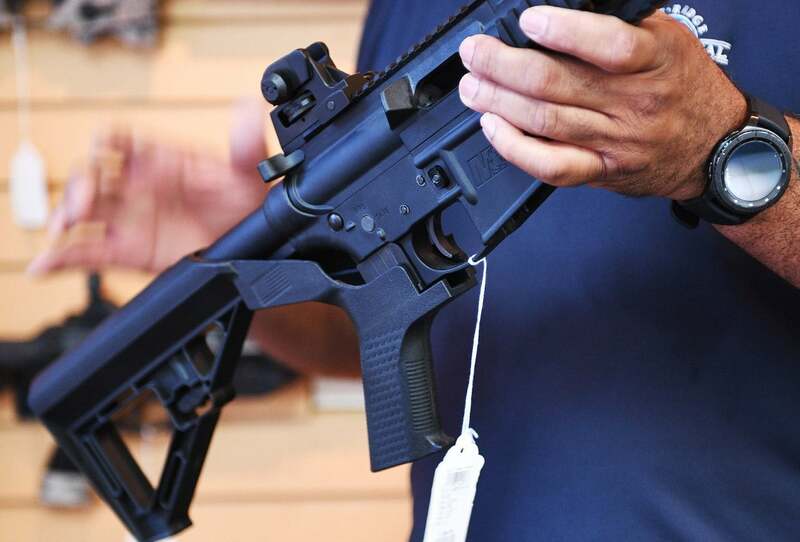 “An estimated half a million bump stock owners will have the difficult decision of either destroying or surrendering their valuable property – or else risk felony prosecution” stated Eric Pratt, executive director of Gun Owners of America. Pratt is also concerned that this might amount to a slippery slope. The fear is that if the ATF implements this bump stock ban without major resistance, they may use it as a stepping stone to take action against other accessories and eventually semi-automatic weapons themselves. “The new ATF regulations would arbitrarily redefine bump stocks as ‘machineguns’ — and, down the road, could implicate the right to own AR-15’s and many other lawfully owned semi-automatic firearms” stated Pratt. Currently the ATF has received well over 65,000 comments opposing the ban but has shown no sign of slowing its enforcement timeline. Does the new ATF ruling follow federal law? Or does this move violate the Constitution? I think they are for wannabes, but this is truly a slippery-slope proposition and the ATF must be stopped. I’m not a fan of bump-stocks. When I want a machine-gun, I buy a machine-gun. However, just because I don’t care for a product, doesn’t mean I don’t care about those who might want one. The much larger problem with this regulation is the ATF is overstepping it’s authority, and clearly VIOLATING the Constitution. If this is allowed to stand, it will be used as precedent to ban many other legal products, and severely infringe on our Second Amendment Rights. I’m 100% with VCDL, GOA, and all other pro-freedom groups who are prosecuting this lawsuit to STOP an out-of-control agency, and make sure this sort of thing never happens again. Why doesn’t this order violate the Ex Post Facto provision in the Constitution? This provision prevents a person from being prosecuted for an action which was not against the law when the act was committed. In fact, why don’t all laws which were passed to be retro-active fall under this provision? They’re not prosecuting anyone, they’re just barging in in the middle of the night and stealing your guns. it’s not a law. Laws must be passed by Congress. This is an entirely unconstitutional regulation by an out of control federal agency. It must be struck down. It is common to get the ornamental painting and sculptures with shapes depicting an appealing mixture of different components from the artist’s religious, physical and cultural background. Leonardo Da Vinci was given birth to inside Florentine Republic on April 15th, 1452. As modern humanity exposes their tanned skin during vacations that they like to show off their pictures in online community websites. In cases like this, you simply must get a rather simple picture frames. in April 22, 1560, he explained:” Your Majesty, you’re invincible and retain the world in awe. Then it is not important when it is heads or tail, one can possibly predict the ultimate results. A huge over reach of the constitutional law on the Atf’s part. just because they are a branch of our government does not give them free reign to walk on our constitutional rights. shall not be infringed upon Means just that, “SHALL. NOT! ITS NOT A CONDITIONAL STATEMENT! In cases like this, you simply must go for a rather simple picture frames. After the Bourbon Restoration, as the trial participant of Louis XVI, David was lacking his civil right and property, and was expected to leave his homeland to stay in Brussels where David also completed many works, and lastly died in a very strange land. Matisse also took over as the king from the Fauvism and was famous inside the art circle. Thank you for sharing excellent informations. Your site is very cool. I’m impressed by the details that you have on this site. It reveals how nicely you understand this subject. Bookmarked this website page, will come back for more articles. You, my pal, ROCK! I found just the information I already searched everywhere and simply couldn’t come across. What a perfect site. completed many works, and lastly died in a strange land.